Trinity Designs: Better Late Than Never - Blogger's Challenge #93! for me because I created a card based on a sketch that is coming up NEXT month. (I blame it on jet lag) They were both in the file, I just didn't read the right week number! Anyway, its bugged me all weekend that I did the wrong sketch, so I sat down yesterday to finally create this card and I really like how it turned out! I did end up changing the layout a wee bit, mainly because my focal image was larger than I had originally anticipated. The card starts with a Chocolate Chip card base folded to make a 3" x 6" card. I layered it with a piece of Kiwi Kiss cardstock and a piece of Whisper White. I sponged the white with some Kiwi Kiss ink on the edges. The pink circle is a piece of Pink Pirouette cardstock cut with my Big Shot Machine and my Circles Die. 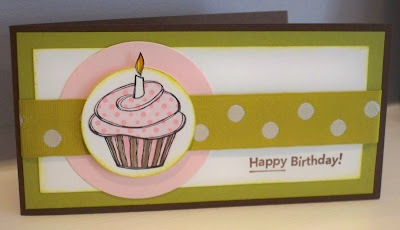 The ribbon I used here was actually my inspiration for the card along with the stamp I used. When we were in Hawaii, we had a chance to spin a prize wheel everyday and one day I won a package of this ribbon called "Pigtails". It has 5 yards of this cute, cute Kiwi Kiss polka dot pattern and 5 yards of some adorable Tangerine Tango Rik-Rak (can't wait to use that!) For this card, I just layered a piece over the front and wrapped it around all the layers, adhering it with SNAIL on the back of the Kiwi piece. The birthday greeting is from the ultra-versatile "On Your Birthday" stamp set - another must own - and is stamped in Chocolate Chip ink. I have been dying to use this cute cupcake image from the "Wagon Full of Fun" stamp set ever since I saw it in the new Occasions Mini Catalog. It's stamped here in Black Staz-On ink on Whisper White cardstock. I punched it out with the 1 3/4" Circle Punch and then stamped the flame again on a scrap, trimming it out with my Paper Snips. I colored the cupcake wrapper with Close to Cocoa and Pretty in Pink Stampin' Write Markers and the flame was colored with Summer Sun and More Mustard. It was attached to the circle punch out with a bit of 2 Way Glue Pen. For the icing on the cupcake, I stamped the image one more time onto a piece of Tea Party Designer Series Paper. The pink polka dots were just perfect for this! It too was trimmed out with my Paper Snips and adhered with some SNAIL to the image. Lastly, I sponged some Kiwi Kiss ink around the edge of the circle. The image is popped up on Stampin' Dimensionals and mounted to the front of the card. So there you have it - my Blogger's Challenge complete finally! Now I better get busy for the challenge that's due on THIS Friday! LOL! In the meantime, be sure to check out all the other Blogger's Challenge Players by using the link in my sidebar. I know they will have some other great ideas to inspire you with this layout. Emma is on Spring Break this week, so we are going out today to have some Mommy - Daughter time. The sun is trying to come out here, so we are going to find a way to get out and enjoy it! Here's wishing you some sunshine today too! Very cute card, Robin! I was confused with two sketches in the files, too! This is super cute Robin!!! I love it and will me casing your card!!! I am glad to hear you are feeling much better!! It has taken a while to adjust back to normal but we have here finally!! Glad you were able to play in the challenge - love the paper pieceing on the cupcaked! Enjoy the day with Emma! YUM!!!! I Luff cupcakes, great card! So worth the wait!!! What a treat to win that fabulous ribbon...you used it perfectly! Very Cute. The paper piecing is so fun and I like how you added the middle strip under the circle. Where have I been??? Looks like i missed a boat load of beauties! Gorgeous job! Absolutely SCRUMTIOUS!!! Love this card!